The aim of Modern Poetry in Translation, since Ted Hughes and Daniel Weissbort founded the magazine, has been to bring foreign poetry into wider circulation in English translation and in doing so, to enrich us all. Translation can be thought of as the transplanting of a living thing out of its native time and place into somewhere foreign. There it may thrive or die. How can the subjects and forms of poetry be transplanted across time and space? Must they be modified? Or can the host culture be induced to accept them as they are? In this issue of MPT we show many of the ways and means by which a literary transplant’s chances of survival may be increased. 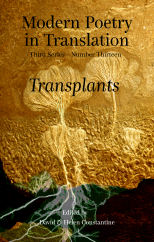 A most substantial and varied issue – more submissions were received for this issue than for any before – ‘Transplants’ brings together poets in translation from China, Alaska, Albania, Vietnam, Brazil, India, Ancient Greece and Rome, Israel and Estonia. Nor are the forms any less varied: epic poetry, tanka, elegy, ballad, sonnet and ghazal, rhyming and unrhyming poems and prose poems all appear here. Amongst many notable poets and translators included here are Marilyn Hacker with her translations of Tunisian Tahar Bekri; Miklos Radnoti translated from the Hungarian by Stephen Capus; Ruth Fainlight with her translations of Peruvian Blanca Varela; and the enchanting Estonian poet Kristina Ehin, whose Selected Poems in English translation was awarded the Poetry Society’s Corneliu M. Popescu Prize for European Poetry in Translation, and whose new book, The Scent of Your Shadow, is forthcoming from Arc. Her translator is Ilmar Lehtpere. Also: new versions of ballads by Itzik Manger, of the French Grail legend, of the English Sir Orfeo (by Maureen Duffy), and of early Brecht. Plus translations of Rimbaud by James Kirkup and of Alaskan Native American songs by John Smelcer. A very great variety of work. The Reviews section is also rewarding: Roger Moulson, whose Waiting for the Night Rowers won the Aldeburgh Prize, appraises the great Yang Lian’s new collection Lee Valley Poems (Bloodaxe Books), and Saradha Soobrayen’s illuminating reviews include one of the Iraqi poet Adnan Al-Sayegh’s The Deleted Part, translated by Stephen Watts and Marga Burgui-Artajo.